The enchantment of the Never Fairies grows stronger than ever in Tink’s dazzling 3D adventure! See the world of Pixie Hollow shimmer all around when you slip your magic glasses on! Tink is making a special sceptre which will raise a magical moonstone and rejuvenate the pixie dust tree. But when the sceptre breaks, it seems Tink has ruined things – until she hears of a lost treasure: a magic mirror which can grant a wish. Will Tink be able to find it? 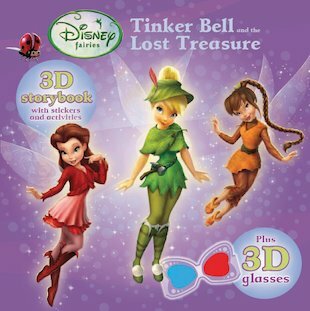 Find out in this magical 3D storybook, which brings Tink’s daring adventure to dazzling visual life. I have to read this book before I read any other book!!!!!!!!!!!!!! !